Chronic myeloid leukaemia (CML) is a myeloproliferative disorder characterised by anaemia, leucocytosis and splenomegaly. The natural history of CML is characterised by three phases chronic phase, accelerated phase (AP) and blast phase (BP). 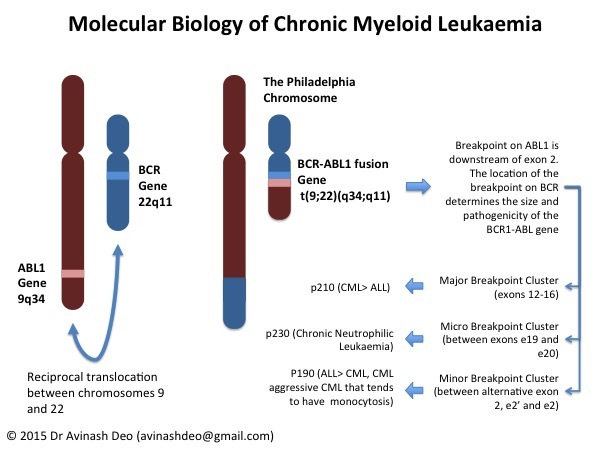 CML is characterised by the presence of fusion gene BCR-ABL1 that results from the t(9;22) translocation. This gene encodes for a constitutionally active tyrosine kinase that has been shown to drive the CML stem cells. The diagnosis of CML can not be made in the absence of this gene. Onset of AP signals a change in the biological behaviour of disease. The disease follows a more agressive course that culminates in blast phase. The blast phase mresembles an acute leukaemia and is a terminal event in the natural history of CML. Inhibitors of BCR-ABL1 prevent the emergence of accelerated and blast phase and have dramatically improved the outcome of CML. CML constitutes about 15% of all leukaemias. The incidence increase with age and the disease is slightly more common in males. The incidence of the disease does not show geographic variation. The only know etiological factor for CML is exposure to radiation. CML is characterised by the presence of Philedelphia chromosome [t(9;22)(q34;q11)] which results from a reciprocal translocation between the long arms of chromosomes 9 and 22 (figure 1). The ABL1 proto-oncogene is located on chromosome 9 at q34. Chromosome 22 has the BCR gene at 22q11. The ABL1 gene translocates downstream to the BCR gene as a result of the t(9;22)(q34;q11) translocation. This results in the formation of the BCR-ABL1 fusion gene (see The BCR-ABL1 Gene). The expression of the ABL1 tyrosine kinase is tightly regulated. The t(9;22)(q34;q11) results in the N terminal segment of the ABL1 gene being replaced by that of the BCR gene. This results in the ABL1 tyrosine kinase being constitutively expressed. The size of the N terminal amino acids contributed by BCR determine the length and the clinical properties of the fusion gene. Progression from a relatively stable phase of proliferation, the chronic phase, to a agressive phase charecterized by increasing leucocytes counts, anaemia and falling platelet counts ultimately culminating in a acute leukaemia like picture, the blast phase. Unlike the chronic phase that shows myeloid and sometimes platelet proliferation, the blast phase may show a myeloid, lymphoid or rarely megakaryocytic lineage. Failure of tyrosine kinase inhibitors to errdicate the malignant clone despite pronounced and prolonged supression of the BCR-ABL1 positive clone. The precise mechanism how BCR-ABL1 leads to chronic myeloid leukaemia is not known. Activation of phosphatidylinositol kinase (PI3K), RAS/Mitogen activated protein kinase (RAS/MAPK) and JAK/STAT pathway has been demonstrated in BCR-ABL1 positive cells. These pathways have been implicated in malignant transformation of cells and are believed to be responsible for the malignant phenotype of CML. Progression of CML from chronic phase to accelerated phase and eventually blast phase marks change in the disease that makes it progressively less responsive to drugs inhibiting BCR-ABL1 kinase. Cells with BCR-ABL1 fusion gene have an increase in the reactive oxygen species predisposing them to DNA damage. Progression from chronic phase to acclerated phase and eventually blast phase is associated with the cell accquiring additional mutations. This is known as clonal evolution. Reactive oxygen species induced DNA damage is believed to result in clonal evolution which results in progression to accelerated phase and blast phase resulting in treatment failure. Abdominal pain, early satiety and fullness because of splenomegaly. The pain is usually a tugging pain but sharp pain may indicate a splenic infarct. Splenic rupture though described is a rare event. Leucostasis because of very high white blood cell counts may present with neurological deficits, respiratory insufficiency or priapism. Incidental discovery for a haemogram performed for another reason is becoming a common presentation in populations that have a good healthcare system. Splenomegaly is commonly seen. Historically CML is associated with massive splenomegaly (splenomegaly below the umbilicus). Today this may be seen only in communities with suboptimal health care and diagnosis is delayed. Hepatomegaly may be seen in some patients. Increasing WBC counts with appearance of new anomalies. These may be basophilia, eosinophilia or increase in the immature forms particularly blasts and promyelocytes. Progression of patients on BCR-ABL1 kinase inhibitors is accompanied by appearance mutations in BCR-ABL1. The TKIs have dramatically reduced the rate of progression to accelerated phase or blast crisis. 4.6% for Dasatinib (DASSISION trial 5 year follow up), 3.5% for nilotinib (ENESTnd)and 8% imatinob (IRIS trial 8 Year follow up). Patients who do not achieve an early response to TKIs have a higher risk of progression. A complete haemogram should be performed in all patients. 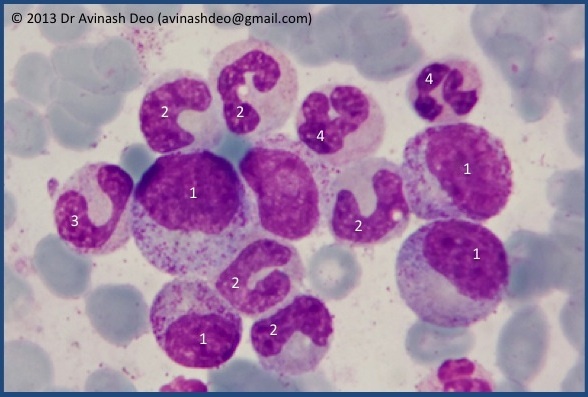 Patients of CML have leucocytosis with shift to the left and often have eosinophilia and/or basophilia. Platelet counts are often slightly increased but may be normal high or occasionally low. There is mild to moderate anaemia. The differential count of peripheral blood depends on the phase of disease. Patients with chronic phase have <10% blasts and ≤ 20% basophilis. Patients with accelerated phase have 10-19% blasts or >20% basophilic. Patients with blast crisis have ≥20% blasts. Bone marrow studies are not needed for diagnosis of CML. This can be made by demonstration of BCR-ABL1 on peripheral blood. Bone marrow studies are essential for determining the phase of disease. The bone marrow of a patients of chronic phase of CML shows a high myeloid to erythroid ratio with a normal myeloid maturation. Dysplasia is not a feature of CML and suggests the diagnosis of myeloproliferative disease/mydlodysplasia overlap. The chronic phase is characterised by <10% blasts. The megakaryocytes are smaller with reduced lobulation and may be increased in number. Bone marrow of patients from accelerated phase show myeloid hyperplasia with myelodysplasia and a blast percentage between 10-19%. Megakaryocytes may be seen in clusters or sheets. Bone marrow from patients with blast phase shows ≥20% blasts. Risk scores help in prognosticating the patients and should be performed at diagnosis. The three scores are listed in table 2. Hasford and Sokal scores are prognostic scores for predicting outcomes of CML patients. The EUTOS score was developed to predict the outcome of patients receiving imatinib at 18 months of therapy and was reported to perform better than Sokal and Hasford scores. It has not been validated by other investigators. The approval of imatinib in May 2001 by the US FDA saw CML become the first disease to benefit from targeted therapy. The 8 year survival of patients in chronic phase has improved from 6% in 1975 to 42%-65% from 1983-2000 and 87% for patients diagnosed after 2001 (Blood 119:1981-87;2012). Before the introduction of imatinib the treatments used for patients of CML included (in chronological order) splenic radiation, arsenic, busulfan, hydrourea and a combination of interferon and cytarabine. With the exception of interferon and cytarabine none of the other therapies suppress the BCR-ABL1 positive clone. The IRIS trial established imatinib, an inhibitor of BCR-ABL1 tyrosine kinase as the first line treatment for chronic myeloid leukaemia. DASSISION trial and the ENESTen trials established dasatinib and nilotinib as front line therapy. Tyrosine kinase inhibitors (TKIs) are the first line of treatment in all patients of CML. The use of imatinib in pregnancy is associated with increase in malformations. These include malformations of the skeleton, respiratory system, kidney and gastrointestinal the gastrointestinal tract. The risk of exompholous is increased by almost 1000 times. Imatinib and other TKIs are contraindicated in pregnancy. The treatment of pregnant woman is challenging. Interferon may be used after the period of organogenesis. Women who have not completed their family are encouraged to do so early and should be switched to TKI. Women in the childbearing age on TKI should be made to understand that contraception is mandatory. Many inhibitors of BCR-ABL1 tyrosine kinase have been developed. Out of these imatinib, dasatinib and nilotinib are approved for use in the first line setting. Dasatinib and nilotinib can be used for patients who relapse on imatinib. Busotinib and ponatinib are approved for use relapsed CML. 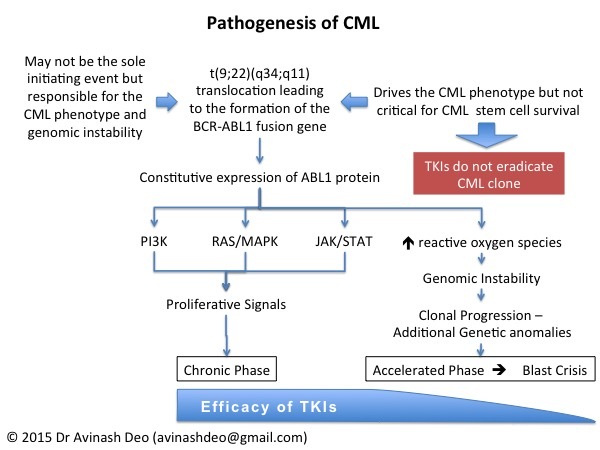 The TKIs drugs used in CML are listed in the table below. CML chronic phase: 500 mg orally once daily with food. Escalation to 600 mg daily in patients who do not respond. A newly diagnosed patients should be initiated on treatment with Imatinib (400mg od), dasatinib (100mg od) or nilotinib (300mg bd). Dasatinib and nilotinib. Busotinib and ponatinib can be used in patients progressing on these the first line drugs. Ponatinib is indicated in the T315I mutations. Patients carrying this mutation do not respond to any of the other TKI. Early molecular response (EMR) – BCR-ABL1 transcripts ≤10% by QPCR (IS) at 3 and 6 months. Major molecular response (MMR) – BCR-ABL1 transcripts 0.1% by QPCR (IS) or ≥3-log reduction in BCR-ABL1 mRNA from the standardized baseline, if QPCR (IS) is not available. a sensitivity of at least 4.5 logs below the standardized baseline. CMR is variably described, and is best defined by the the assay’s level of sensitivity (eg. MR 4.5). The haematological and cytogenetic milestones in the treatment of CML have been described by the NCCN and ELN. Secondary resistance to TKIs results from point mutations. Mutations analysis of the kinase domain of ABL should be performed in case of failure to achieve or loss of a milestone. Mutations that result in resistance to the first line TKIs are characterised and mutational analysis serves as a guide to choose second line therapy. The T315I mutation imparts resistance to all TKIs except ponatinib. The TKI treatment needs to be continued lifelong. Attempts to withdraw treatment in patients who have achieved prolonged deep molecular response have shown that the disease returns in a majority of the patients on discontinuation of treatment. Allogenic stem cell transplant was the mainstay of treatment of CML before the introduction of TKIs. The availability of many TKIs has diminished the role of allogenic stem cell transplant. Allogenic stem cell transplant is indicated only in patients who progress on TKIs. Introduction of imatinib altered the prognosis of CML by converting it form a progressive ad fatal disease to a chronic disease. The 8 year survival of CML on imatinib is 85%. Those progressing on imatinib can be treated with other TKIs. Previous Why Blood Loss From Sites other than Gastrointestinal Tract Rarely Causes Iron Deficiency?